As with all good horror films there comes the sequel and so it is the turn of Insidious to get the reboot treatment. Will Insidious 2 go the way of most sequels, offering the same as the first film but with bigger scares? In some ways it does, but the film justifies itself enough to make a sequel. The film starts right where the first Insidious ends, and it does help if you have seen the original movie first. Be warned if you haven’t seen insidious 1 as I’m going to reveal some spoilers. Having rescued his son from demonic possession there is suspicion that the father isn’t who he seems to be. To rescue his son the father had to travel to an astral plain. Whilst he was there was he himself possessed by an evil old woman? The film is built round this is he/isn’t he plot, a standard in horror films, where good people turn bad, with the reason why being because of supernatural reasons. Insidious 2 goes into more depth, pans out the world in which the film is set, but is essentially the same film as the original. In this second film we find out about the old woman, who appeared as a fairly peripheral figure in the first installment, only appearing in the end. Insidious 2 is genuinely scary and it goes for you right from the start. While other films may build up tension to some kind of ending, Insidious 2 gives you scares throughout the film. It doesn’t give the viewer much of a reprieve between shocks as there is no knowing when the next scare will come from and what it will be. And just as the slow build up and supernatural atmosphere create a scare, the music /sound effects come in from nowhere and cuts that tension in two by the sound of screeching strings, which leaves the viewer battered. They are really the trademark of the film franchise. How could the title shot make you jump? Just put some screechy strings on at excessive noise levels coming in from nowhere. Away from the thrills and spills and haunting tone, there is a bit of humour with the inept ghost busters returning from the first film. Their bumblings, although not laugh out loud funny are able to lighten a little bit of what is a gloomy film, where everyone is playing it so seriously. Insidious 2 manages to keep all its film references tight together, but towards the end of the film loses itself to cliché and becomes hackneyed as the father goes all The Shining on his family. 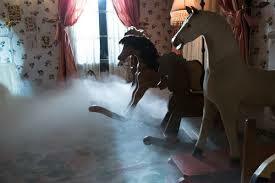 What’s fairly unusual about Insidious 2, for a film made nowadays is that there are few special effects. Most of the scares come through traditional methods of camera and actor position. Most of the ghosts are people in make up, Goth- like in their white washed faces and black eye-liner. There is also little gore, the film is only a 15 certificate, which although a bit light suggests a film built on tension. This film is worth seeing if you are into horror films or enjoy a scare or two. It may not offer much new but its commitment to good old fashioned scares is welcome. Here’s hoping for a sequel. Matthew Algar will be creating a 10 week Bionicle animation series, a continuation from his current Bionicle Blogs series on YouTube specially for VXM & ICTV. During the process Matthew will be put through specialised master classes to help improve the quality of his series. Episode 2 – The Faint Light of Tomorrow. Bloodtide and Kokuto do battle!! Look out for Episode 3 – The Nightmare Continues, Malachite Escapes! Zoe interviews music industry professionals Jade & Curtis. 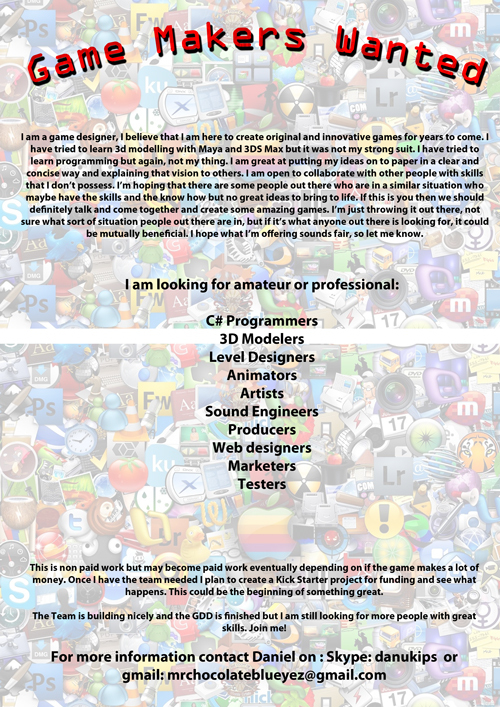 Local game designer Daniel Shepard is looking for a team to help participate in the creation of a game. Amateur or professional he wants to hear from you. If you can do one of the following you should get in touch. This is a non paid opportunity, BUT if the game is successful everyone involved will be paid! So what have you got to lose?! Khadeem ‘Velly’ Edwards tells his story in music. Matthew Algar will be creating a 10 week Bionicle animation series, a continuation from his current Bionicle Blogs series on YouTube specially for ICTV. During the process Matthew will be put through specialised master classes to help improve the quality of his series. Week 1 – Sound. In the first episode we see Bloodtide justify his reasons for killing, but Kokuto undermines him! Look out for Episode 2 – The Faint Light of Tomorrow. Bloodtide and Kokuto do battle!! It’s hard to believe it’s been three years since Gru, the bald, evil villain (with the most unidentifiable accent), and his hilarious minions exploded onto our screens. I watched it a week ago, and was struck by how often I found myself in fits of ache-inducing laughter (honestly, I was in a lot of pain). 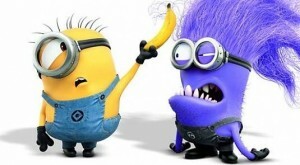 With this in mind, I was unsure – even sceptical – that Despicable Me 2 would be any better. Silly me. Gru has turned his back on his villainous past to become a more hands-on dad to his adopted daughters, Margo (Miranda Cosgrove), Edith and Agnes (who is as adorably odd as ever). He has also started up his own business, making jams and jellies, with Dr. Nefario (Russell Brand), though his old friend would much rather be playing the evil scientist he has always been. Life is boring, but good…until a mysterious woman named Lucy dramatically shakes things up. She kidnaps Gru and takes him to Silas Ramsbottom (Steve Coogan), the head of The Anti-Villain League – and he needs Gru’s help. A dangerous purple chemical called PX-41, that can turn people into mad, powerful versions of themselves, has been developed by an unknown baddie, and it seems only a former baddie can figure out who it is. Despite initial grumblings, Gru can hardly resist playing spy (although he is less than pleased to have Lucy as his partner), and it isn’t long before he’s getting into all kinds of slapstick hilarity. 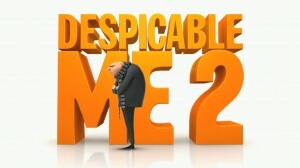 This is what sets Despicable Me 2 and its predecessor apart from any other animated feature, I think. The comedy is an outrageous mixture of physical and the just plain unpredictable, courtesy of an intelligent script and some of America’s finest comics providing the voices to bring it to life. Kristen Wiig, for example, is exceptional, playing a feisty secret agent with all the best gadgets, like a handbag that turns into a hand-glider (I want one! ), and then of course there is Steve Carell. He reprises his role as Gru, and it’s here we see a more vulnerable side to the anti-hero, as he attempts to juggle being a good dad to his girls – imagine the shock he gets when Margo meets a boy! – and finding the culprit behind PX-41. And where would he be without his loyal minions? They once again steal the show, though this time they play a more pivotal role to the story, other than a healthy dose of belly-laughter. So, this summer, I insist you take the kids to see this film. You will be so glad you did, and not just because they will enjoy it – you all will. Soundisiak event in Ipswich featuring Dean Atta, Yoji, Languid, Moonstreet & Sleepless Wild.